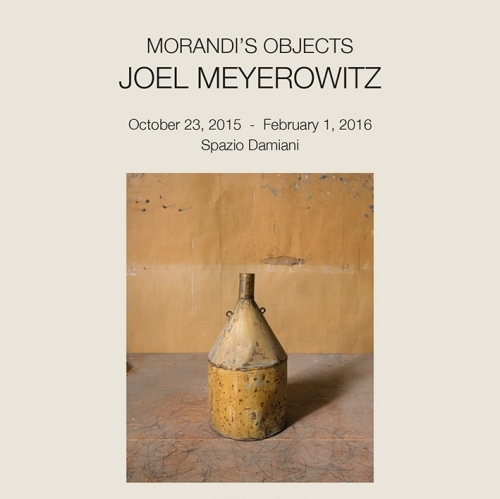 Damiani presents Morandi’s Objects Joel Meyerowitz, the first exhibition in the publisher’s new gallery space at via dello Scalo 3/2 abc, Bologna. With this exhibition and publication produced by Damiani, celebrated American photographer Joel Meyerowitz pays tribute to the Bolognese painter Giorgio Morandi and realizes his dream of photographing the objects Morandi painted in his splendid still lifes. The exhibition will present about 20 works in various sizes, and will be on view from 23 October 2015 until 1 February 2016. Thanks to the support of the Istituzione Bologna Musei | Museo Morandi, Meyerowitz was granted access to the rooms in Casa Morandi, where the painter’s objects still remain. Taking over 700 photographs, the American photographer completed a profoundly taxonometric survey of 270 dust-covered objects in the small room where Morandi worked: vases, shells, bottles of all sizes, painted over, filled with raw pigments, colored bottles or plain, silk flowers, jugs, boxes, tin cans, funnels, and more. Meyerowitz treated his photographs as portraits, turning each object slowly until one facet spoke more clearly than any other and revealed the secret identity that Morandi valued each object for. For the exhibition, Damiani is publishing a book entitled Morandi’s Objects. The book’s wide selection of photographs will be accompanied by a text by the artist and an introduction by Maggie Barrett. A special limited edition of 25 copies with a signed and numbered photograph by the artist will also be published. Joel Meyerowitz will give a public talk at MAMbo’s conference room on Friday, 23 October 2015 at 4:00 p.m., where he will discuss his work and his relationship with Morandi. On the occasion, he will also donate one of his works to the museum, which will expand the Morandi Collection and document the artistic dialogue between the American photographer and the Bolognese artist.